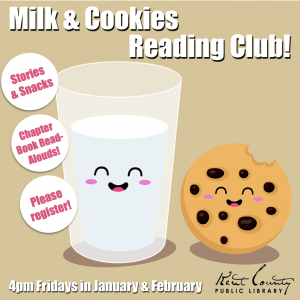 Join us on Friday afternoons in the months of January and February for a chapter book read aloud. Kids can come and listen each week as we go through a chapter book together and enjoy a snack! We will be reading: Fortunately the Milk by Neil Gaiman Alvin Ho: Allergic to Girls, School, and Other Scary Things by Lenore Look The Miraculous Journey of Edward Tulane by Kate DiCamillo Registration Required.